They make their way to the door that blocks entrance to the garden, only for Dredd to show up behind them, heavily armed and fairly insane. Those bones in Dredd’s body, they’re not his, they’re causing him to act differently. He then decides to show the Knights what has been hidden from them all this time, taking them into a hidden chamber, arguing with himself along the way, until they find the Grass Program – it wasn’t destroyed after all. 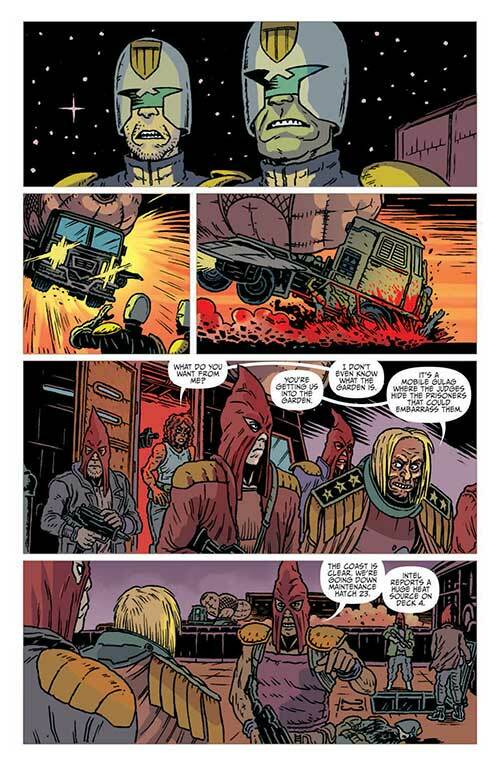 As Dredd accesses the computer, Quill accuses him of corruption, asking how he out of 800 million people can be the one to decide what is right or wrong. 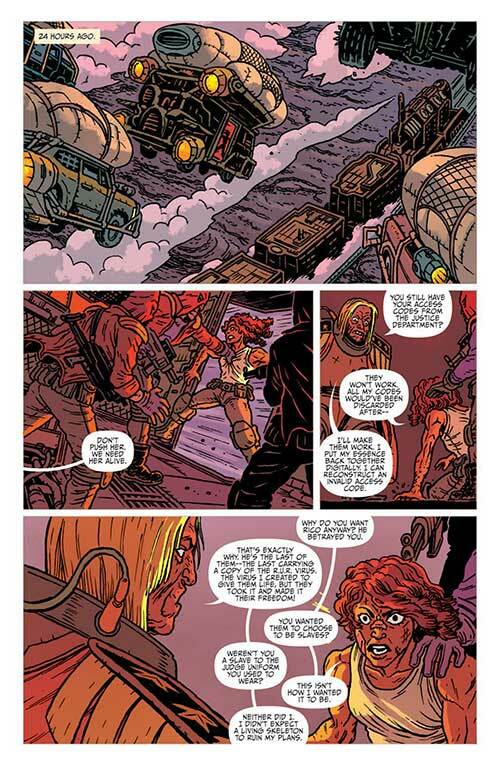 Once Dredd unlocks everything, a brawl breaks out – mob rule, as Quill puts it – and when Rico is freed, he takes it upon himself to ‘reset’ the human race. And then the Red Judges show up. Well, you won’t see this ending coming. The eighth and final issue of the Blessed Earth storyline ends with a serious bang. 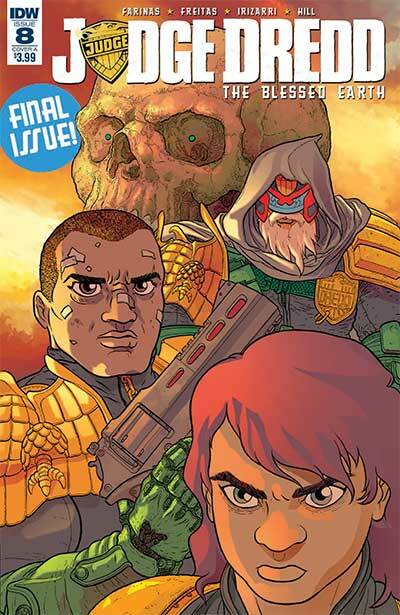 It’s got everything you could want out of a good Dredd story – biting social commentary, dystopian action aplenty, fantastic character development, noble sacrifice, dark humor, fucked up supporting characters and even some top notch explosions! The story from Ulises Farinas and Erick Freitas gives us plenty of food for thought about the role and purpose of law enforcement in modern society, the good and the bad that comes with it and the mindset of those who are involved in it. The result is a pretty heavy story, one that touches on the importance of freedom, the evils of racism and the perils of systematic overreach when it comes to deciding what is right and what is wrong. They have effectively held up a mirror to modern day America, its reflection somehow able to not just show us what we already know is wrong, but also make an entertaining and intelligent story out of it. Daniel Irizarri (who, according to a text page in the back of this issue, was late with the art for this chapter due to Hurricane Marie’s impact on his home in Puerto Rico – an issue still not properly addressed by the government at the time of this writing) delivers the best looking issue of the series to date. 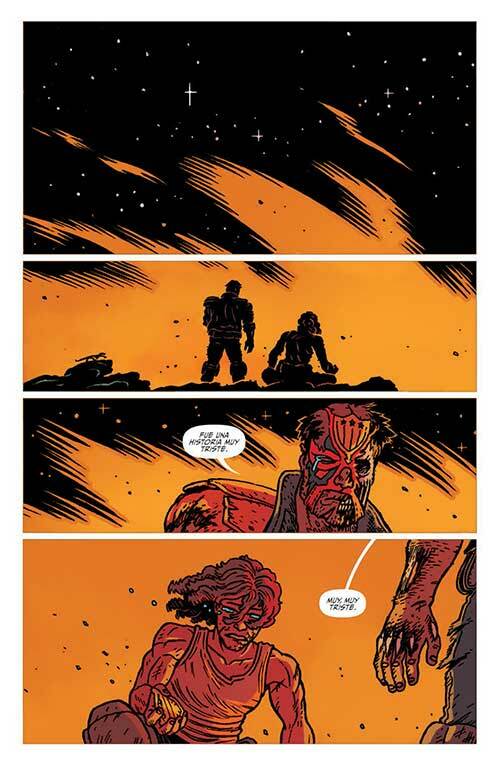 There’s loads of detail here and his unique style suits the post-apocalyptic western vibe of the story really well. 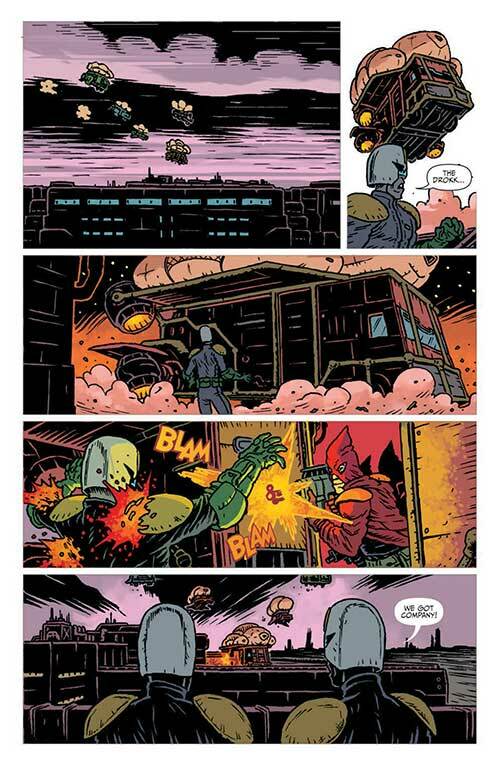 Ryan Hill’s coloring work complements the artwork really nicely, heavy on orange and red, bringing the heat of the desert where all this takes place to the page perfectly.